Patients are seen by referral from other physicians, as well as by self-referral, where permitted by their insurance plans. Dr. Bellovin participates as a primary care physician as well as a cardiologist with many plans, so that patients can often receive all of their care in one place. Nuclear testing is performed at a nearby, state-of-the-art radiology facility. Dr. Bellovin is on staff at North Shore University Hospital in Manhasset, a renowned, tertiary care center, for patients requiring hospitalization or invasive procedures. Patients requiring hospitalization are admitted to North Shore Hospital under the auspices of hospitalists and cardiologists who care for the patients in close consultation with Dr. Bellovin. North Shore Hospital was recently named the best hospital in the United States in a nationwide survey featured in Modern Maturity magazine. Our entire staff is dedicated to providing personal and attentive care in a comfortable and professional environment. We also work to protect our patients' privacy, and are fully compliant with HIPAA regulations. For your convenience, Dr. Bellovin participates in many insurance programs, including Aetna-USHealthCare, Blue Choice, Cigna, Empire Plan, FirstHealth, GHI, MagnaCare, Medicare, MultiPlan, Oxford and United HealthCare. Your heart is a muscular pump about the size of your fist and its primary function is to pump oxygenated blood to the rest of the body. It is made up of four chambers, the right and left atria on the top, and the right and left ventricles on the bottom. The septum is a thin muscular wall that separates the right and left sides of the heart. Each contraction of the heart occurs in response to an electrical impulse that originates in the upper portion of the heart. Blood is moved in a closed circuit through the body by the pumping of the heart. The heart contracts and pumps blood out to the body (systole) and relaxes to fill with more blood (diastole). The heart muscle itself is like all other organs in the body and requires oxygen to function. The oxygen-rich blood is circulated to the heart muscle through the coronary arteries. There are two main arteries: the right coronary artery and the left main coronary artery, both originating from the aorta (the main blood vessel of the body). 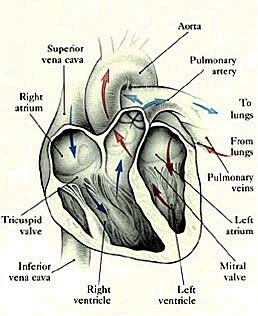 These vessels then branch off into smaller and smaller vessels along the surface of the heart. - Is the conduction system (the wiring) in the heart following the normal pathway? - Is the heart muscle getting adequate blood supply and oxygen through the coronary arteries (the plumbing)? 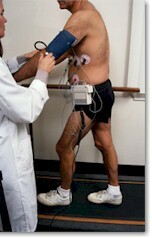 - Is the pumping function of the heart muscle capable of circulating blood to the rest of the body? Your initial consultation with Dr. Bellovin is extremely important. This initial consultation is your introduction to Dr. Bellovin, who will elicit a detailed history of your problem and perform a thorough examination of your heart and vascular system. The history of your problem will also include eliciting information about other diseases and symptoms, a medical history of your close relatives, and information about the risk factors that lead to coronary disease (hardening of the arteries), elevated cholesterol and other fats in your blood, high blood pressure, diabetes, and smoking. Dr. Bellovin will also want an exact list of your medications and the dose and frequency that they are taken, as well as any history of medication, allergies or intolerances. It is helpful if you bring a list of your medications with you, or bring the medicine containers themselves. Pertinent information, especially test results, from other doctors should be secured, if possible, for review. At the completion of your initial consultation, Dr. Bellovin will usually have a reasonable impression about the nature of the problem and what additional tests will likely be required to further clarify the diagnosis. You can help him by being thorough, but also concise in supplying the above information in response to his questions.